Is there something puzzling you about the Rock-a-Bye-Baby Gift Box service? Some question that remains unanswered? We've gathered a list of our most frequently asked questions to help you out. If you still can't find the answer to your question, email us and we'll get right on it. Can I have the baby gift basket, box, bouquet, nappy cake or baby hamper delivered to me rather than the new parent? Yes, however we would rather deliver the baby gift direct to the new parent as everyone likes to receive something through the post other than bills. However this is completely up to you, simply tick the 'mail to same address' on the order form. My baby gift has been delivered but it doesn't contain the same items as was displayed. We are constantly seeking new items to put into our gift boxes for babies. Unfortunately due to circumstances outside of our control we may not be able to send the baby gift box containing exactly what was displayed at the time of your order. We reserve the right to replace items with something of equal or higher value. I'm not happy with the new baby gift you delivered. We want all our customers to be 100% satisfied with the baby gift they have purchased. If you are not satisfied, please return it to us in an unused condition stating why you were dissatisfied and we will give you a full refund. My new parent is still in hospital, can you deliver it there? No. Generally someone has to sign for our baby gift boxes and we would rather the nurses concentrate on making people well. Please have the baby gift box delivered to the new mum's home (if someone will be there), your home or your place of work. Alternatively, immediately after you have placed your order, contact us (by phone or email) and advise us when you would like it dispatched. I see you accept credit cards? I don't have one, is there any other method I can use to pay for a baby gift? Of course. Credit card is the most common method of payment, however we do appreciate that not everyone is happy using this method. You may pay by cheque or postal order or direct to our bank account. Simply email us your order and your chosen method of payment. 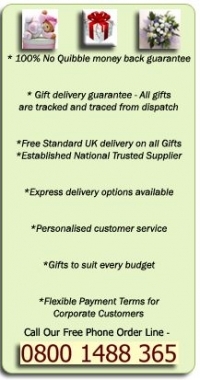 Once we have received payment and it has cleared (cheque only) your baby gift box will be dispatched. Please ensure you advise the new parent that there will be a delay in receiving their baby gifts if you pay by cheque. My baby gift box has arrived but it is in a terrible state. Occasionally during the postal process things can get damaged. However please be aware that the box itself is only there to protect the baby gifts you have purchased. If the baby gifts inside the box are in perfect condition then we are happy. If your baby gifts are damaged in any way, simply send the gift box back to us and we will of course replace it. Please ensure you obtain a proof of posting certificate as we cannot be held liable if your gift box should go missing in the post and proof of posting has not been obtained. I ordered my baby gift box 10 days ago, where is it? This isn't good. The baby gift box should reach your new parent (or yourself) within 5 days, if it hasn't been received by then we will need to investigate further. If I opt for next day delivery but today is Friday, when will it be delivered? Next day delivery paid for on a Friday will be received by the recipient on the following working day - usually a Monday. This is provided the baby gift was ordered by 2pm. Orders received after 2pm will be processed the following working day. Working days are Monday to Friday.